Wow, about half our leaderboard has gone down today. The StreakMaster couldn't be more happy with a Manchester United-Villarreal draw and a solid Washington Wizards win. "bigsam" had a pick for a little bit, but decided to take it down right before tip-off, therefore he still stands at 23. 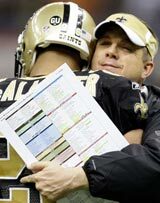 The StreakMaster should have been in this hug, celebrating a streak of 24 going down. As The StreakMaster was watching the "Monday Night Football" game last night, he thought to himself, "If I am nervous watching this with no money on the line, how are the leaders feeling?" Seriously, what on earth goes through your mind, not only making the 25th pick but watching it on television too? All The StreakMaster knows is that getting to 24 is emotionally draining enough, but losing on the last pick? Man, oh man. It's not easy getting 25 in a row, trust me, although The StreakMaster has done it TWICE! The UEFA Champions League kicks off our day with matches at 12:30 p.m. ET, and 2:45 p.m. ET. With the draw included, Juventus and Villarreal are favored, but with Villarreal going up against the defending champs, Manchester United, anything can happen. Our lone NBA matchup may look like a mismatch when looking at the teams' records, but the Wizards should come out extra motivated since they lost their coach yesterday. In our game of the night on ESPN Classic, Navy is on the road at Northern Illinois (-3). So far, Streakers like the Midshipmen as underdogs on the road for some reason. The StreakMaster is going the opposite way, so good luck with that choice. The StreakMaster did some major damage to the board last night, destroying 62 percent of streaks, including our former leader. Bigsam1122 is now king of the mountain with 23 wins in a row but with The StreakMaster on a streak breaking roll, who knows how long he will last.